If you were a talented engineer on a mission to defeat Talon, what would you make? A sweet set of armour? A sick mechanical flail? Or maybe you'd just put some armour on your cat to create the ultimate weapon: JETPACK CAT. 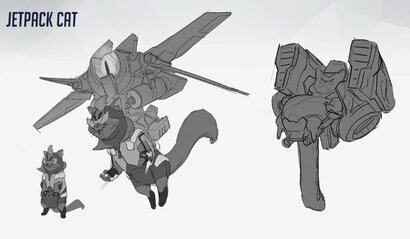 Here is concept art of legendary scrapped Overwatch hero, Jetpack Cat. During a BlizzCon panel about Overwatch's formative days, game director Jeff Kaplan and art director Arnold Tsang talked more about his origins, saying that they were trying to figure out how far was too far with regards to character designs.